Architectural photographer Tae-ho Jeong graduated from Seoul Art College (Department of Photography) is acting as an expert photographer in the field of architecture and interior design. He represents Space Studio, is a regular member of KAPA (Korea Advertising Photographer Association), and works as the head of the photography department at the Interior Design Monthly. He held private exhibitions including Black and White Exhibition hosted by Yeon Art Gallery and Photo exhibition of Korea Interior Design hosted by Gwanhwoon Art Museum. He hosted a book publication ceremony <Light of Enlightenment - Vairocanna Buddha> and photo exhibition at Gallery LaMer, and held a private exhibition through the invite from Gyeongju World Culture Expo. As an active member of a diverse number of group exhibitions including the KAPA member exhibition and International Advertising Photo Exchange, he is remaining active in his work in related fields. What are the major impressions you have in terms of differences in architectural photography and taking Buddha images? I was committed in interior and architectural photography for the last 30 years in Korea. Then in recent 10 years, I devoted myself to showing Buddha images “as they are” with untainted documentary photography rather than through the approach of an architectural photographer. Architectural photography strongly involves capturing the beauty of artificial design and natural aspects together. Also, it is related to finding harmony between space and time. 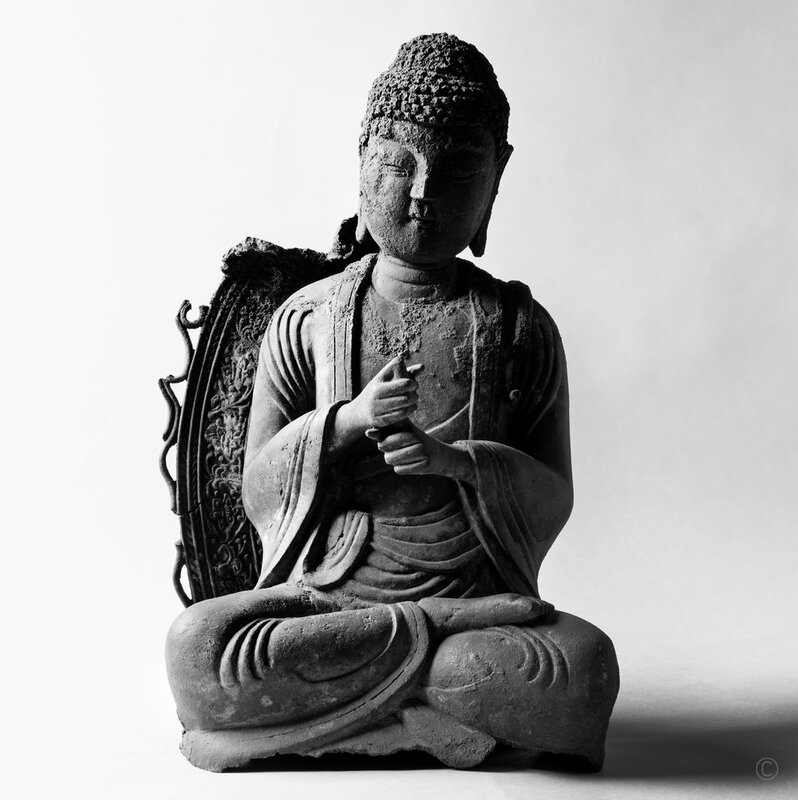 In the contrary, reinterpreting the figures of delicately carved Buddha into conventional photographs, was challenging. In the beginning of my work, I spent several months to visit the same sites, consistently looking for the most perfect lighting from different times of the day. I eased myself as a photographer and tried to confront and reflect the nature itself as they are without artificial lighting and techniques. I made my best effort to “show them as they are” in purely documentary style photos. What is your inspiration on showing Buddha images, and what is the message you’d like to convey? Over 30 years of my career in architectural photography, I realized there is beauty of lines in oriental architecture, which led me to comprehend aesthetic matters from the figures of Buddhas. I personally believe Buddha himself has the most beautiful and generous smile of lines, embracing great depth of mercy. Furthermore, these thoughts guided me into a 10-year long master project. I am a believer of Buddhism myself before I start my career as an architectural photographer and the teachings of Buddhism have encouraged my career with favorable result as a photographer. Not only just as a believer, but also as an architectural photographer, I think compiling and publishing all the images of the Buddhas scattered around Korea is one of the ways to contribute my skills to Buddhism in a meaningful way. Over the 10 years of my project, I am strongly aware that numerous Buddhas were damaged from poor maintenance. I hope we all develop awareness of our vulnerable history. From a cultural perspective, the first Buddhist cultural book named <Light of Enlightenment - Vairocana Buddha> was published with a collection of 1,700 images of Buddhas, from the Unified Silla Period to the Chosun dynasty. Also, I would like emphasis on the back of the Buddha statues to the world. Not a lot of people have the chance to see it and it has been misunderstood as solemn and obscure. Nonetheless, I can feel the monks have contributed significantly even on the rear part of the Buddha statues. I perceive that lines in the back of Buddha statues convey to the world great sense of energy and strength. By taking this opportunity, I want to share the beauty of the lines of Vairocana Buddha. I hope this collection can bring more interests in Korean culture and Buddhism to everyone. When an event is held at a Buddhist temple, a flag called the ‘Tang’ is installed at the entrance of the temple. The pole where the flag is hung is called the ‘Tanggan’, and the two stone pillars on either side of the Tanggan’s to support the Tanggan is called the ‘Tanggan Jiju’. The Tanggan Jiju is set-up in front of the temple and is used to mark the sacred area. The biggest Tanggan Jiju in South Korea, At Gulsansa Temple, was built using one giant stone, and showcases the simple yet breathtaking beauty of sculptures. Built during the Unified Silla period, the 5.4 meter granite pillars vibrate with the power and wisdom of the Silla people. The sky was clearing after the evening rain. I cannot forget the moment I first saw the statue. The second it revealed itself from the dark museum storage (after requesting a viewing with much difficulty), I saw a treasured heavenly face, shining an endless smile upon me. I was lost for words for its dignified form did not succumb to flames hot enough to burn the body. The slightly imbalanced face allows mankind to realize ‘something’ deep inside their heart. The ‘Ji-kwon-in’ is a handshape which implies ‘reason and wisdom, all creatures and Buddha, and delusions and enlightenment are one by origin’. Thus, posing the Ji-kwon-in means ‘sound wisdom and rapid enlightenment can be attained through a devout disposition’. The basic form of the Ji-kwon-in holds the two hands in front of one’s chest, holds the left-hand’s forefinger up, and wraps it with the right-hand so the tip of the left-hand forefinger and bottom of the right-hand thumb touches each other. Granite may be well-known for its hardness but seems like it also cannot withstand the weight of time. This photo reflects my intention to focus on becoming one with Buddha and gaining inner peace and rest through the help of the flower blossoms on Buddha’s body. It was a big challenge and pleasure to seek out an untaken track. It is my honor to hold an exhibition before the important people who foretold me about the values of the challenge. It was a great pity that there was no guidebook on Buddhist images on the level of the whole country despite the fact that Buddhism had left numerous cultural heritages for us for 1700 years since the religion was introduced to this land. But at last, it has materialized. I devoted myself to showing Buddha images “as they are” with untainted documentary photography rather than through the approach of an architectural photographer. Lastly, I would like to give big meaning to the fact that the photos collected in the book were surveyed and taken by myself without external assistance. I would like to invite you to the photography exhibition at the Hong Kong Art Fair. It would be a great pleasure to see you at the event. The Spring edition of the Asia Contemporary Art Show is held on the 40th to 43rd floors of the 5-star Conrad Hong Kong in Pacific Place. The 5-star hotel is conveniently served by the MTR station in the basement of Pacific Place and has abundant car parking and taxi ranks outside the hotel or at Pacific Place 1 and 2.